The Shark Model PB Fish and Ski Design is the ideal boat for fishing, skiing, and boating fun. The Shark's maneuverable hull form allows you to turn the boat quickly in case a skier has to be picked up in a hurry. The Shark's fast bottom also allows the boat to accelerate quickly, thus making it easier for a skier to get out and on top of the water. 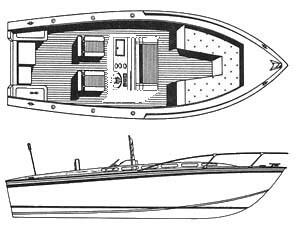 Accessories shown in the Fish & Ski model, such as the upholstered individual and forward seats, the bow rails and hardware are at the discretion of the builder and are not included in the complete boat kit.